Available in Matte black with black metal accents. These strike a balance between the noise isolation of closed-back cans and the spacious noise of open-backed ones. Beefy 50mm drivers add oomph! What makes the K550 so special? Combines the advantages of closed-back headphones (no sound leakage for a truly private experience) with the open sound of open-backs (typical “speakers” sound) – making it ideal for both home and street use. 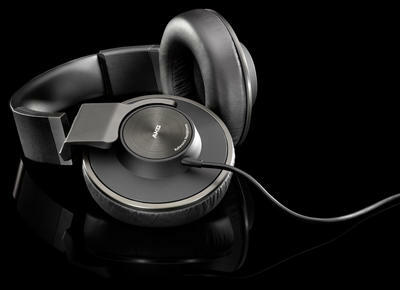 The 50mm (2'') driver, the biggest driver in the AKG headphone range,delivers a realistic soundstage – far beyond what other headphones typically deliver. With large ear cups and a new, lightweight headband design, the K550 offers an amazing, comfortable fit allowing for hours of continuous listening. The K550 works and plays well with virtually any portable device including iPod, iPod touch or iPhone.